Normally I try to write reviews as soon as I read a book but this one affected me to the point that I had to wait a few days and think about the book before I could review it. It's about integration in Winston Salem NC in the early 60s. Even though I didn't live in the South during that time period, I have lived in a town close to WS for 40 years and have heard stories about the sit-ins at the Woolworth stores in Greensboro and WS. This wonderful, well-written book gave those events a human perspective. 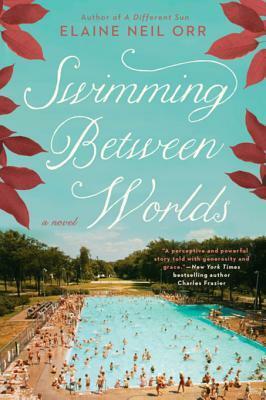 Swimming Between Worlds is about the lives of three people. Tracker, a college graduate in architecture who spent 18 months in Nigeria on a special project. While he was there he made friends with the people he worked with and grew to love African culture. When he returned to NC in disgrace after being fired, he started to question why black people didn't have the same rights - why they couldn't order food at a lunch counter or swim in a public swimming pool. His evolving views were not the norm for white people during this time period. Gaines is a young black college student who works for Tracker. Gaines is very involved in the Civil Rights movement and the social unrest of the times. Kate is a young woman who has just lost her mother and is unsure of what to do with herself. She and Tracker had known each other in high school and when they meet again, they both want to get to know each other better. Her views on racial issues reflected the attitudes of the white people during this time. All three main characters change as they go through the upheavals in America during this time. This is a wonderful, well-written book and I encourage everyone to read it to get a better perspective of life during this time period and how it continues to reflect what is going on in the US today. If you enjoyed this book, you might also enjoy An American Marriage by Tayari Jones and The Vain Conversation by Anthony Grooms. Thank you so much, Susan. What a pleasure to meet you today. Thanks for coming out in the rain. I appreciate your thoughtful review. Writers need bloggers! Let's keep the connection. It was great to meet you, too. I really enjoyed learning more about how your early life affected the story line of your book.